A revitalized Philadelphia Flyers team is coming into this clash as winners of back-to-back games, scoring a total of nine goals. The Tampa Bay Lightning have dropped four of their last five and their usually so efficient offense has been nowhere to be seen. They’ve not had any problem scoring on Philly over recent meetings though, claiming five straight scoring four goals or more in each game. I think we’ll see a high scoring tilt at Wells Fargo Center tonight. 1. The Flyers Power Play – Only the Penguins and the Capitals have a better conversion rate on the power play than the Flyers 24%. They’ve been particularly prolific as of late, finding the net in seven consecutive games while going 7-for-20 on the man advantage. 2. 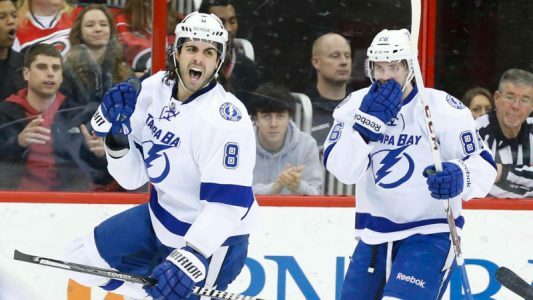 Road Woes – The Lightning have conceded 22 goals over their last six outside of Tampa, winning only one of those games. 3. X-Factor – Jakub Voracek is tied with Evegni Malkin for second place in the NHL with his 37 points. He has four points over his last three games, and he’s likely to add to that total tonight.